Just because your boat has been hauled for the winter does not mean that you can’t get out and explore Chesapeake country. There’s much to do along and near the waterfront during the holidays for the whole family. Here’s a sampling of our favorite land parades, celebrations, and Chesapeake Bayholiday destinations. For a roundup of lighted boat parades visit our Deck the Hulls article. In 1986, a group of friends drew straws to see who would go out and water ski in a Santa Claus suit on Christmas Eve. The one who lost did so, at which time he decided he would do it again next year. In 1987, local news covered the show. While you might say he initially lost the bet, this water skier definitely won it for the sake of children and families alike. The tradition of spreading cheer through this spectacle continues today, after more than 30 years. 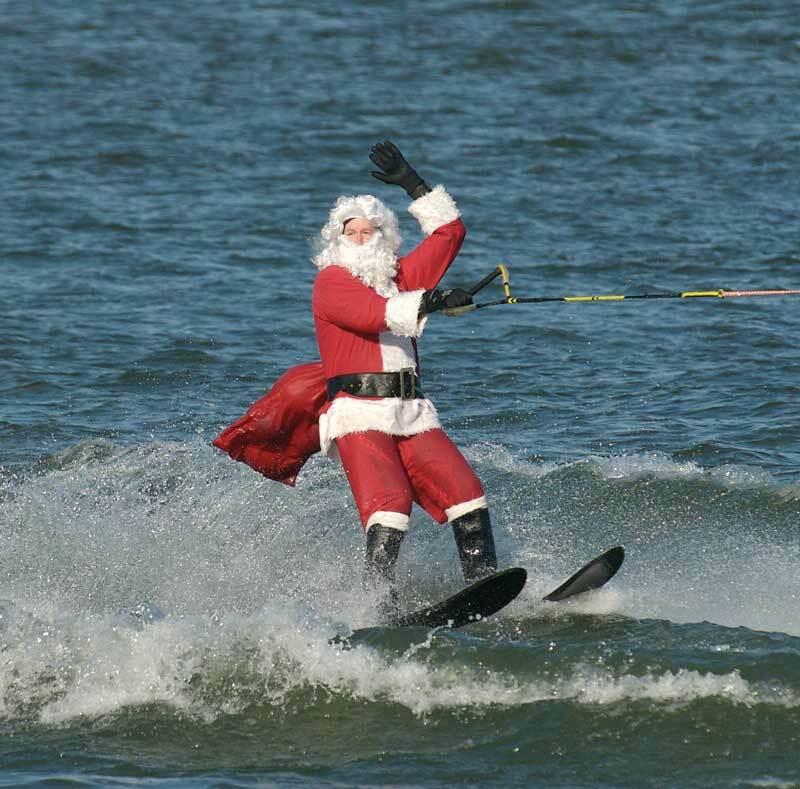 Find the waterskiing Santa show along the waterfront from the Torpedo Factory to Lumley Point on December 24 at 1 p.m. Downtown Annapolis Partnership presents Midnight Madness, a Historic Downtown Annapolis holiday tradition. We here at PropTalk love these two evenings, Thursday, December 6 and Thursday, December 13, for many reasons. For starters, it’s all about shopping locally. But shopping is only one part of the event. The decorated storefronts and winter-wonderland atmosphere, carolers, street vendors, and many boating friends greeting one another on the sidewalks of West Street, Maryland Avenue, State Circle, Main Street, Market Space, Randall Street, and Dock Street make this event a must-attend one. Some features: Holiday Light Canopy over West Street, Snowflake Alley (a favorite selfie spot), carolers, musicians, and other street performers. Downtown merchants may offer complimentary refreshments and specials. Free Circulator Trolleys run into downtown from several parking garages. For free and/or reasonable parking ideas, visit the Downtown Partnership of Annapolis. This one is not on the Chesapeake, but if you’re on your way to the beach the day after Thanksgiving, we highly recommend the Tree Lighting and Open House at the Atlantic Hotel in Berlin, MD. Live ice sculpture carving, warm welcomes and yummy treats in shops and galleries, and craft beers and hot chocolate will be there—Santa, too! November 23 from 5:30 p.m. to 9 p.m. 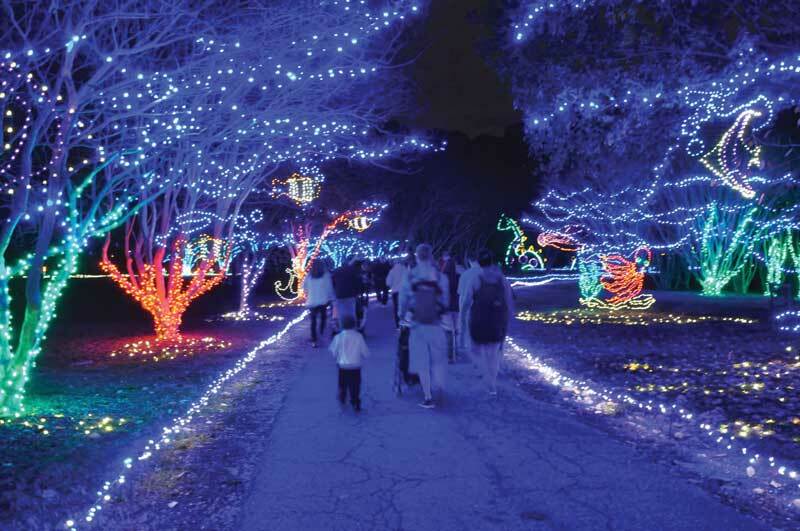 Walk through spectacular holiday light displays at Norfolk Botanical Gardens from 4 p.m. to 9 p.m. daily starting Friday, November 9, through Saturday, December 15. The display closes at 10 p.m. The event route is more than one mile long and is accessible for strollers, wheelchairs, and mobility-assistance devices. A limited number of wheelchairs are available on a first-come first-served basis in the Visitor Center. At the end of the route, there is a tram that will take guests back to the parking lot. Marigold & Honey will provide a number of snack and beverage options (no outside food and beverages allowed). Dogs are not permitted at this event, but they are invited to Barks and Bulbs January 3-5. Advanced ticket purchases are recommended; tickets run from free (children two and younger) to $17, with discounts for military and garden members. Taking photos and posting them to social media with the hashtag #NBGLights2018 is encouraged. This celebration lights up the town December 7-9 with a party, a parade, shopping, and great food and hospitality that spills from one end of Talbot Street to the other. On Friday December 7, the Marketplace and Sweet Shoppe opens to the public at noon. That evening revelers will gather for dancing and food at the Miles River Yacht Club for a Yuletide Party. On Saturday, December 8, the Christmas Parade kicks off at 10:30 a.m. 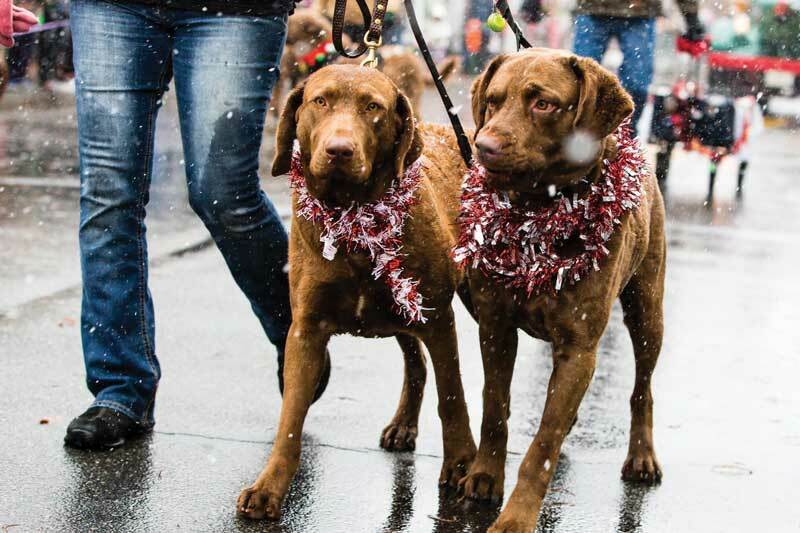 This charming hometown parade features Santa and Mrs. Claus, marching bands, a pack of Chesapeake Bay Retrievers, a surfing snowman and more. Before the parade, kids, parents, and grandparents are all invited to Breakfast with Santa at the Lighthouse Bar and Oyster Grill (125 Mulberry Street; order tickets online). On Saturday and Sunday, lovers of historic homes will enjoy the popular Christmas in St. Michaels Tour of Homes. Seven historic and significant homes, all decked out for the holidays, will be open to the public from 11 a.m. to 5 p.m. Saturday and to 4 p.m. Sunday. The tour showcases a mix of 18th and 19th century seafaring homes that have been updated for modern living. In-town homes are within walking distance; all others can be reached via a shuttle service. All proceeds from Christmas in St. Michaels go to fund local non-profit organizations that provide important services for local residents. Four big events bring the Yorktown, VA, community together November 30 to December 2: a Christmas Tree Lighting, Christmas Market on Historic Main Street, Lighted Boat Parade, and Cookies with Santa. The weekend begins the evening of Friday, November 30, with the annual Christmas Tree Lighting Ceremony at 7:30 p.m. Everyone is invited to gather at the Yorktown Victory Monument by 6:30 p.m. Highlights include a performance by the Fifes and Drums of York Town, festive music at Riverwalk Landing, the procession of lights through the historic village, and the arrival of Santa and Mrs. Claus. The excitement continues Saturday, December 1, with the 13th annual Christmas Market on Main Street. 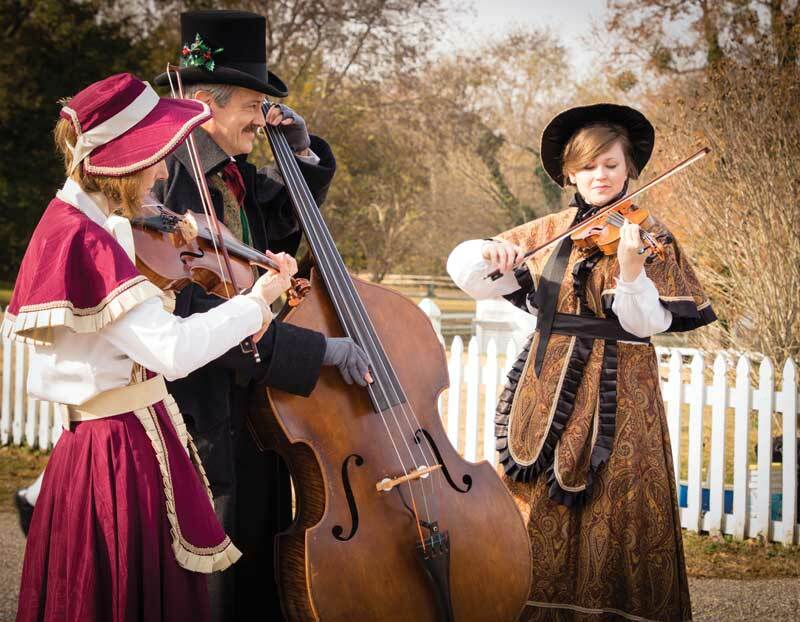 From 10 a.m. to 3 p.m., visitors can enjoy musical entertainment, roasted chestnuts, arts and crafts vendors, food, and a visit from Santa and Mrs. Claus. The Town Crier rings in the market at 10 a.m., followed by a performance from the Fifes & Drums of York Town to officially open the market. Main Street entertainment begins at 10:30 a.m. with strolling instrumental ensembles, caroling, and holiday arrangements, concluding at 1:45 p.m. The Lighted Boat Parade begins at 6 p.m. (Find this and other regional parades on page 24). On Sunday, December 2, Santa will be at York Hall with cookies. Historic buildings and museums to visit in Yorktown include: Custom House, American Revolution Museum at Yorktown, Yorktown Battlefield, Watermen’s Museum, York County Historical Museum, and Museum on Main. Just a short walk (or trolley ride from Main Street), you’ll find Black Dog Gallery, Redcoat Antiques, and all Riverwalk Landing businesses waiting to welcome you in the spirit of the season.